It is not unreasonable to be afraid of riding horses. You can be completely enchanted by their beauty, power and majesty and simultaneously feel anxious about the prospect of guiding and riding a living being who outweighs you by several hundred pounds. In this article, we help you identify your level of fear and possible causes. We also provide sound advice to help you prevent or overcome fear of riding horses. Read on to learn more. 2 How Should You Be Around Horses? Most of the time your fear is related to your level of skill. If you are inexperienced, you will naturally be nervous. The best way to whittle away that sort of fear is to work steadily at improving your horsemanship, both on the ground and in the saddle. Riding should not be the first thing you do around horses. Spend some time working around the barn, walking, grooming, feeding and observing first. Learn to read and understand the signals horses constantly convey through body language. By spending time around horses and learning about their care, you can increase your confidence level and develop good horse sense. This involves cultivating a way of being around horses that instills calm in both you and your horse. When you can move around and handle horses confidently on the ground without startling yourself or the horse, you are ready to begin working on your riding skills. How Should You Be Around Horses? Horses don’t like sudden movements, loud noises and rushing around. Focus on being relaxed and calm around your horse. Don’t wave your arms around or shout or do other unexpected, potentially frightening things. move about in a calm and rhythmic way. Be aware of your surroundings and pay attention to what you are doing. Don’t try to carry out long, non-related conversations with others or talk on your phone. Focus on your horse. Establish a routine and stick to it. Predictable repetition is calming for both you and your horse. When you are ready to ride, having the right horse is an extremely important aspect of building rider confidence and overcoming fear. If you are attempting to work with a horse who is not a good match for your personality and your skills or who is simply too hot for you, you are sure to be afraid, and with good reason! If your horse is unsuitable for you, it is unlikely that you will be able to overcome your fear of him. If your horse is too ill-mannered and unruly to handle at all, you may feel afraid to catch him, lead him, groom him or feed him. If you determine that your horse is just too much for you to handle, you may need to find a more suitable mount. This may mean rehoming the horse you have and finding a quieter horse, but before you do this talk with your vet. Your horse may just be “hot” because of an excessively rich diet. Alternately, your horse may need more exercise to work off excess energy. Learning how to do lunging exercises with your horse helps your horse burn off energy and learn to work with you as you develop confidence and skill. Working gradually to change your horse’s diet while doing groundwork may be all it takes to make a big difference in your relationship with your horse and your ability to overcome your fear. Be patient. It may take a couple of months to begin to see improvement in a hot horse with bad ground manners. The importance of finding a good instructor as you work on building your self confidence cannot be overstated. If you are just starting out, you need to have a knowledgeable guide at your side. Even when you become experienced and are confident, you should always have someone knowledgeable close at hand in case something goes wrong. When you seek out an instructor and/or trainer, look for one who specializes in working with you and your horse. Some trainers get fast results by dominating and scaring horses, but this is not a sustainable method. If the trainer controls the horse with fear, this means you will have to control him with fear, too. That’s no kind of relationship to have with your horse, and sooner or later it will lead to rebellion and danger. Your goal should be to understand your horse well and gain his trust. When your horse decides he wants to join up with you, then you will be able to work together without fear. Taking your time to perfect your groundwork methods and establish a quiet way of being around your horse pays off. 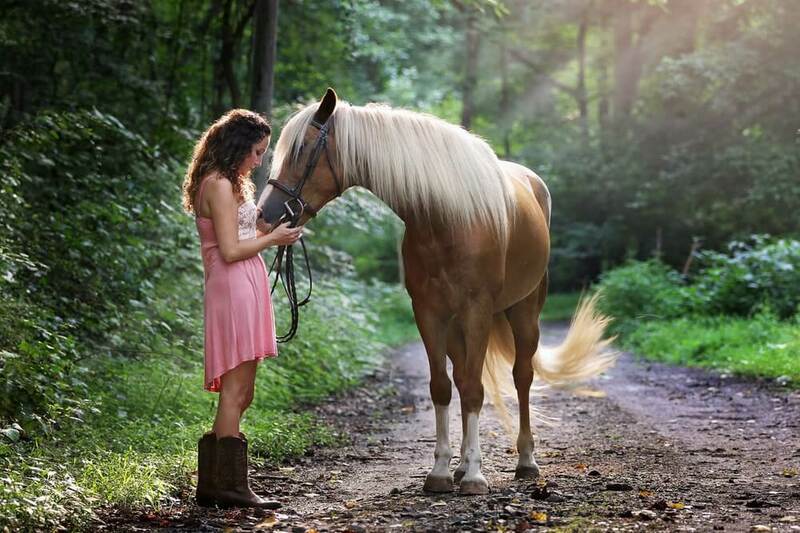 When your horse feels safe and confident around you, you can feel safe and confident around him. If you have been confident with horses in the past but have become afraid due to a fall or an accident, you may need to start from square one to build your skills again. If you’ve been badly frightened or injured, this process can take quite a while. Understand that you should take exactly the amount of time you need to get over a bad experience. Don’t let anyone pressure you into getting right back on that horse or swallowing your fear. If you force yourself to “get over it”, you may ultimately find yourself paralyzed by fear when you can least afford to be. Taking the time to work through your fears and sort them out systematically can help you truly overcome them. It may be helpful to see a counselor to talk through your fear. A behavioral counselor can help you create a step-by-step plan for overcoming your fear of riding. Your counselor may also suggest hypnotherapy as a way of overcoming fear, and this can be a very effective method. Hypnotherapy can help you see the incident in a different way and approach similar situations in the future from a new perspective and with greater confidence. Fools rush in where angels fear to tread, and anyone with any horse sense can tell you that a measure of fear/respect is a good thing to have if you want to deal with horses successfully. Your horse is much bigger and more powerful than you are. That’s why it is so important to take the time to build a positive relationship. When you gain your horse’s trust, you will also gain his cooperation. This is essential to being able to ride with confidence and with only the appropriate and sensible amount of fear.